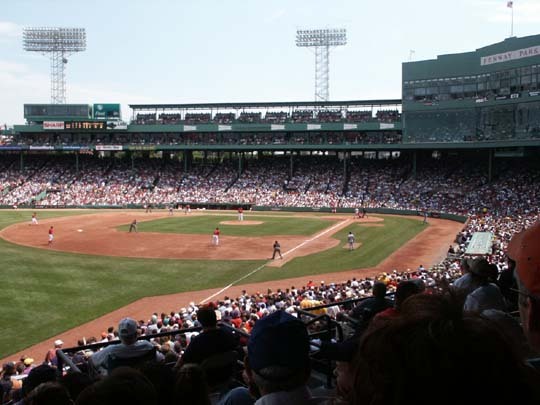 The Boston Red Sox play in Fenway Park which opened in 1912. 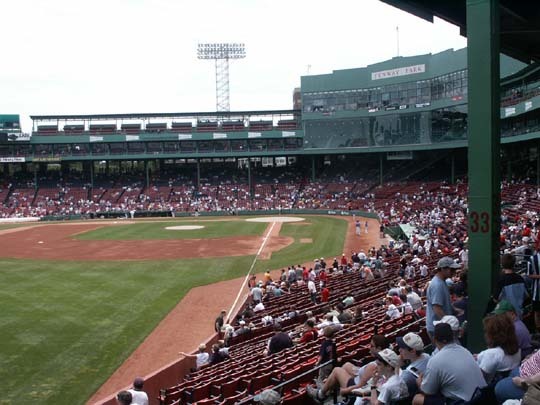 Fenway Park is small when compared to other major league parks, but that is the charm. Almost no where are you far from the field. Part of the reason is that the seating is very close together and whenever someone wants out to an aisle everyone in the row has to get up. 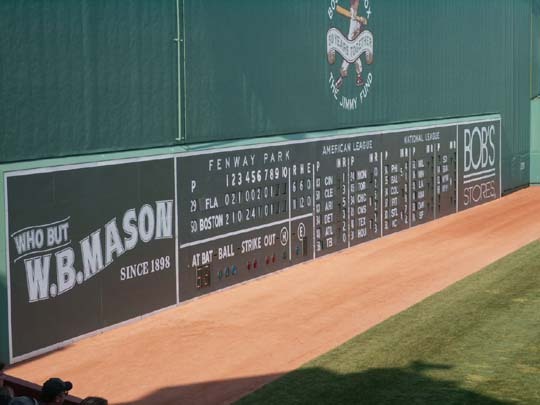 Here at Fenway is the famous Green Monster left field wall placed there because of the short distance to Lansdowne Street abutting left field. 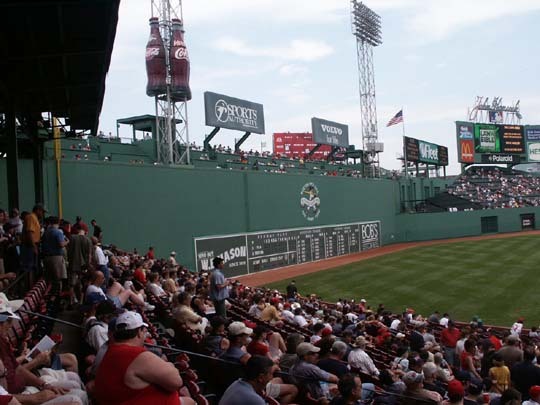 Seating has been added to Fenway by putting seating above the roof, adding a luxury glassed-in seating area behind homeplate above the regular seating, and in 2003 adding seating above the Green Monster, now seating 39,605. 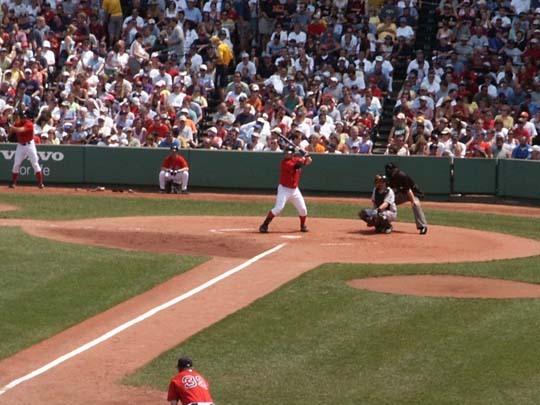 The Red Sox were playing Florida Marlins and beat them 11-7. 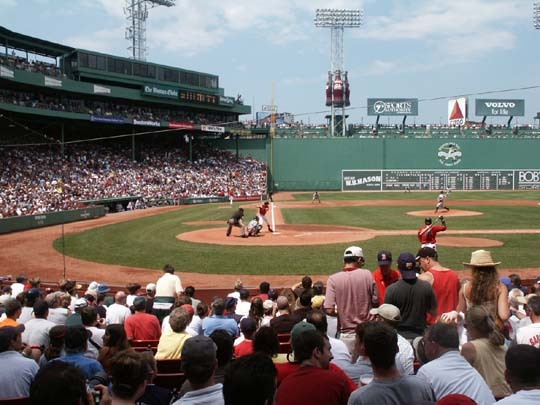 The box score was Marlins R-7, H-8, E-0 and Red Sox R-11, H-12, E-0. 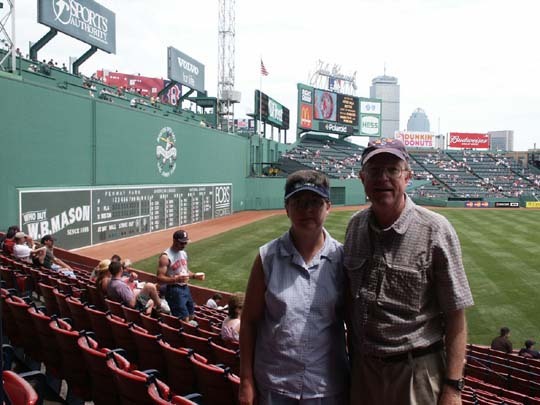 We saw several homeruns, including 5 sent over the Green Monster, none of which were caught by the fans sitting there. One hit the Sports Authority sign and would have cleared the new seating area. The field lines are RF-302' (the Pesky pole), RC-382', CF-420', LC-379' and LF-310'. 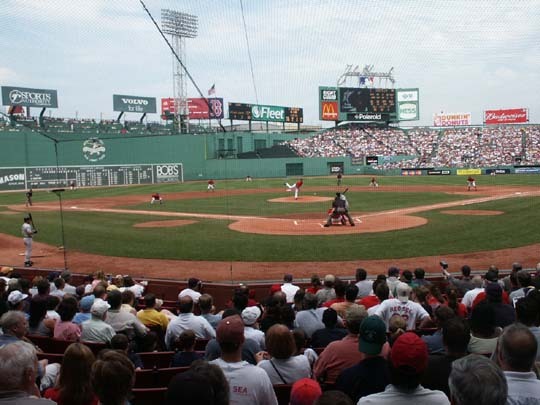 The game was a sell-out, as are most games at Fenway. 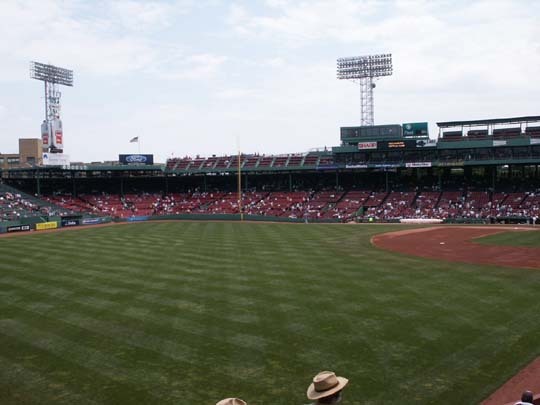 The attendance was 34,476. 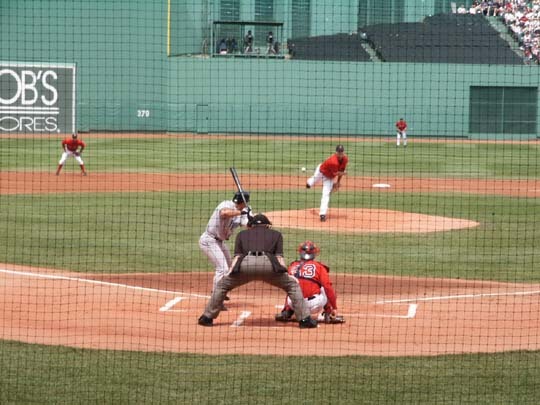 We had great seats in the second section from the Green Monster, under cover, which was nice as it was a sunny and very warm day. 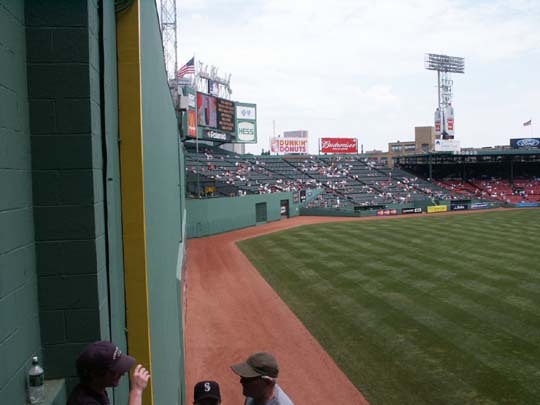 Bill Spanswick, 1964 pitcher for the Red Sox, was signing autographs on his player picture and Jim was able to get one. 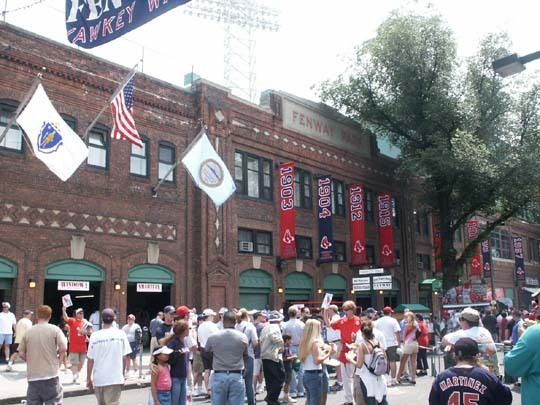 We walked around the field ending up on Yawkey Street. 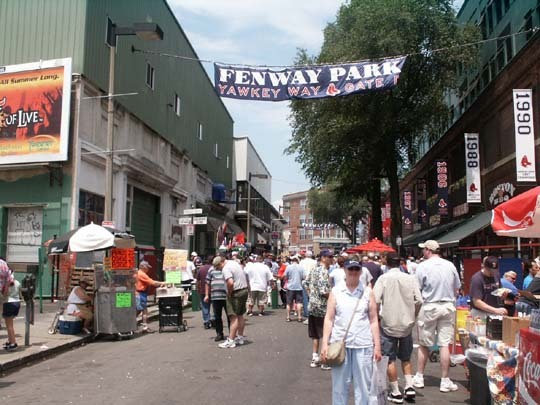 Up until last year Yawkey Street had vendors along it selling food before the game. Now the Team has taken control and has the food concessions on the street. 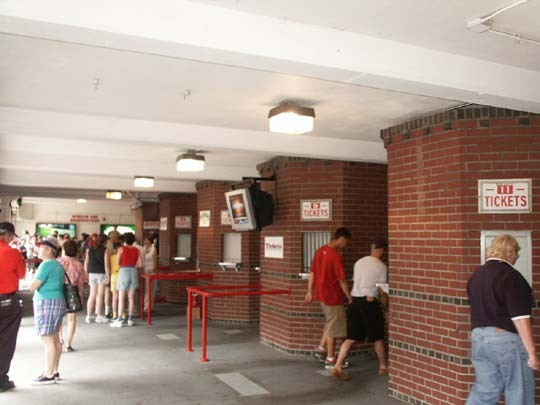 One picture shows the old ticket selling booths inside the main entrance to the park. 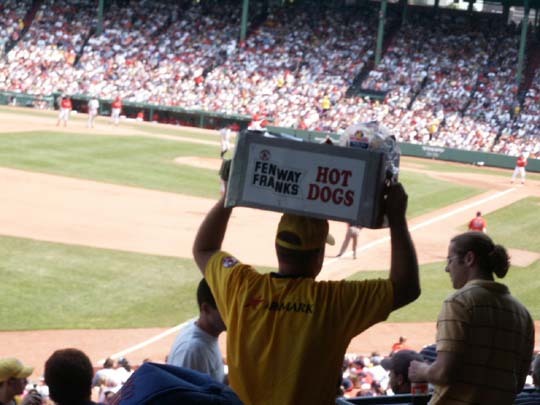 There are hot dog sellers in the stands who throw you the mustard and catsup packets and then throw you your Fenway Frank wrapped in papers. Sometimes they miss. 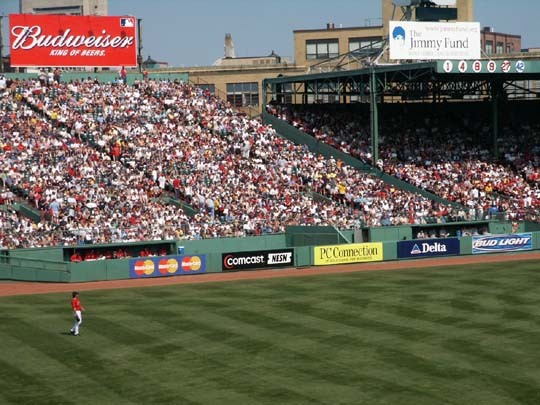 Bottled Coke products and ice cream sandwiches are sold in the stands. We did not see beer being sold in our area. 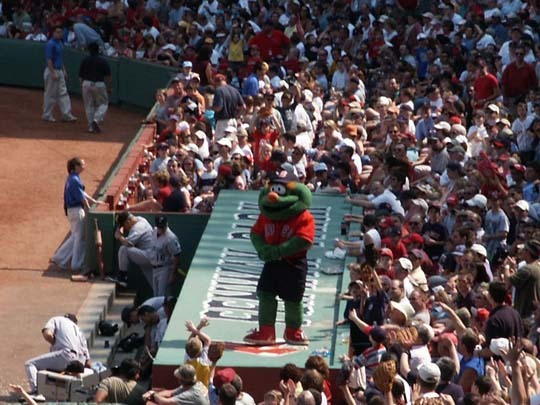 Wally, the Green Monster, is the mascot. 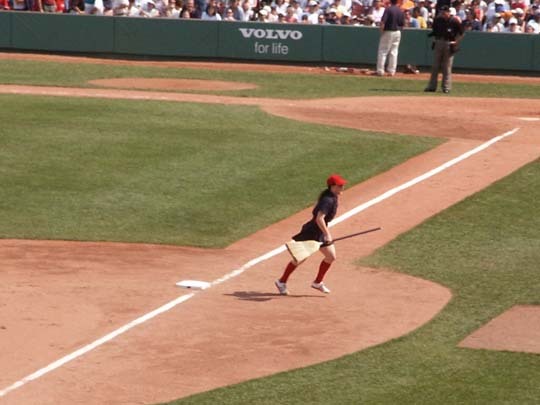 During one mid-inning grounds crew screening of the infield a woman comes out, sweeps the bases and throws a baseball into the crowd on the third base side of the field. 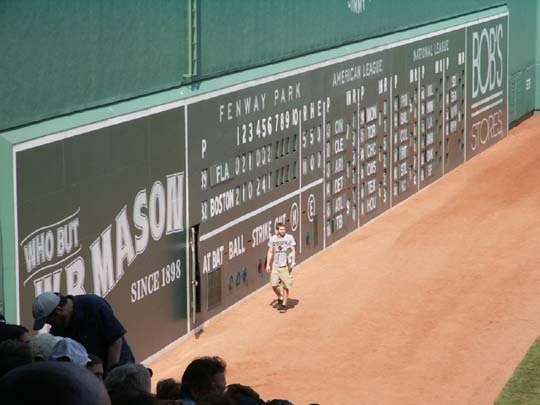 The Green Monster scoreboard is hand operated. Between innings the operator comes out to change the scores on the out of town games. 2009 new logo. 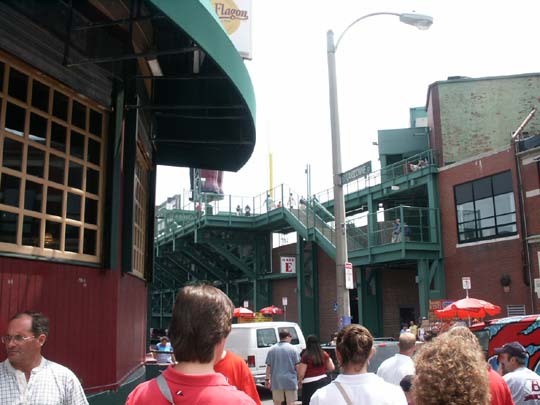 Freedom Trail Walking Tour passes many of the city's historic sites--Boston Common, Massachusetts State House, Granary Burying Ground, King's Chapel, Old State House, Faneuil Hall, Paul Revere House, Old North Church, USS Constitution, & Bunker Hill Monument are a few of the sites you will pass. Outside of Boston: Lexington & Concord-Revolutionary War and Lowell - textile industry.